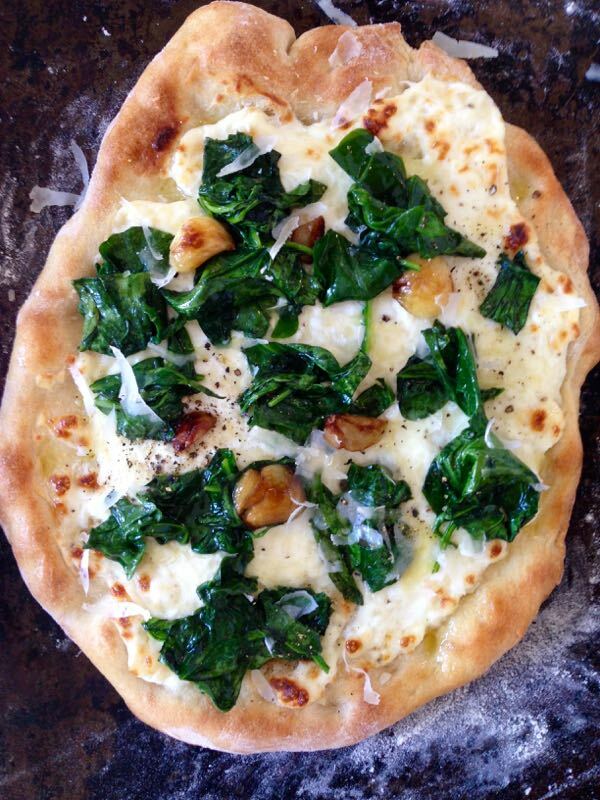 This white ricotta spinach pizza with sweet roasted garlic cloves is a nice way to say good-by to summer. Naturally I wanted to close our little summer pizza series with one of my favorite healthy flavor combinations: ricotta + spinach! 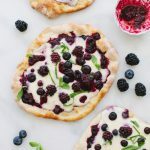 If you like white pizza, then this one is for you! Now you know ricotta spinach anything is a winner in my book, what a lovely pair, wouldn’t you agree ? Add some fontina to the mix and you got yourself some real magic happening. Let’s not forget about that garlic: you roast it straight in the skillet on low flame until golden and sweet. Then you add the spinach and let it wilt for just a minute. I actually eat that straight out of the pan like that for breakfast. 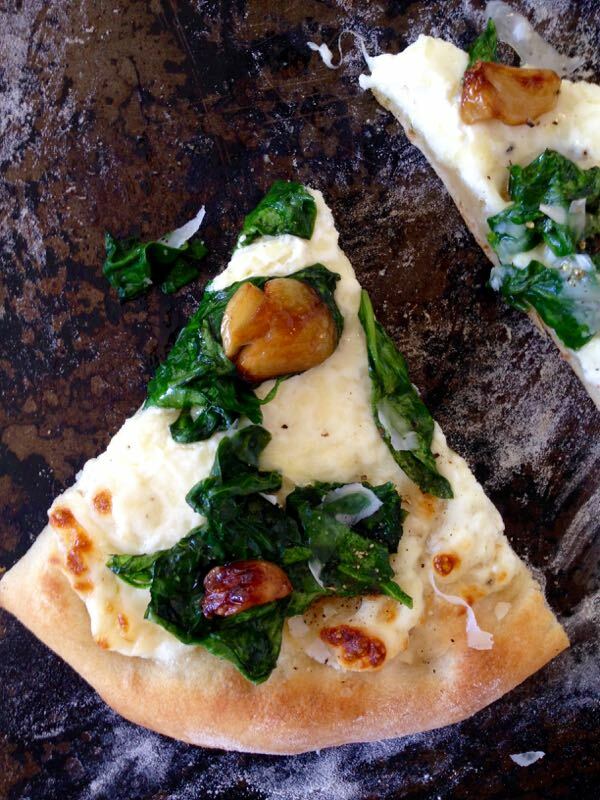 You should definitely cook the spinach before putting it on pizza, it just calls for that kind of texture. Very important: use a pizza stone (<–amazon) preheated with your oven! I know I said it like 15 times before, and I’ll continue saying it till the day I die. Unless you have a pizza oven, go get yourself a cheap pizza stone today. You will thank me later, I know this. 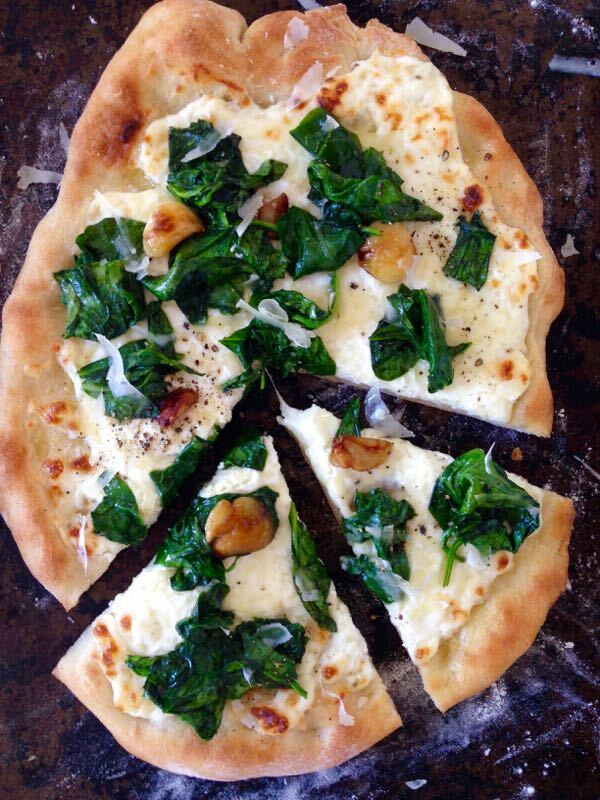 Ricotta spinach and garlic on a thin crisp crust, I mean what else is there ..? A good movie and a chilled bottle of white vino, hashtag #LifeMade ! Oh, you see those little fire kisses on top ? So cute, I know! You can get those by putting the pizza under the broiler flames for about 30 seconds at the end. Of course If you have your own pizza oven you are a boss and the broiler step won’t be necessary. Not in the mood for spinach ? Just replace it with some cooked Italian sausage, or with a few anchovies for a Pizza Bianca alla Romana. 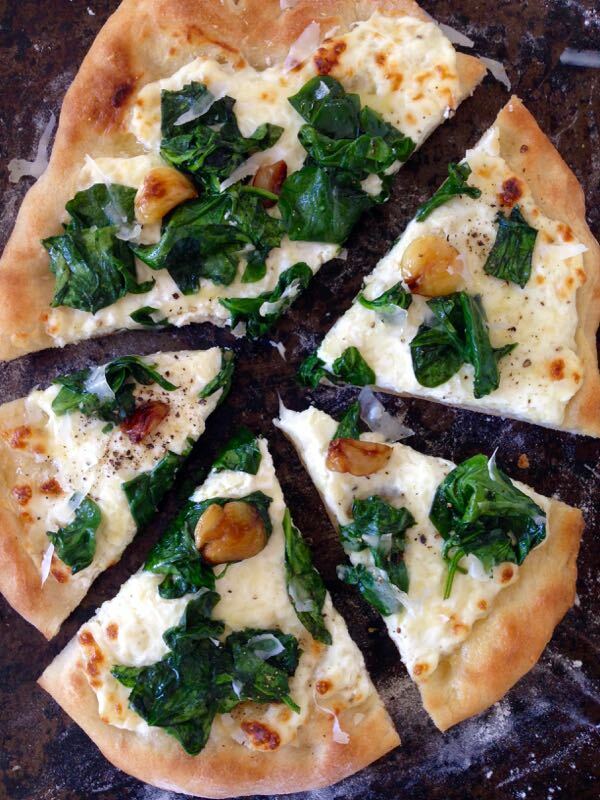 Italian crispy thin crust Pizza Bianca with ricotta, healthy spinach and roasted garlic. Make a batch of the rustic pizza dough. Smash the garlic cloves with the side of a chef’s knife and peel. In a large skillet add a lug of olive oil and roast the garlic cloves on medium low flame until golden. Add the spinach with a pinch of sea salt and using a pair of tongues toss to coat in the oil and roasted garlic. Cook for a couple of minutes until wilted and remove from heat. Makes her not to overcook it. Add the ricotta and fontina cheese to the bowl of a food processor together with a lug of olive oil and a pinch of sea salt. Process until combined and set aside. Preheat your oven with a pizza stone in it to 500”F or as high as it will go. Form the pizza pies as instructed in the rustic pizza dough recipe and brush each one with a thin layer of olive oil on top. Leave about 1/2 inch at the edges. Sprinkle with some of the parmigiana region cheese on top and bake in the preheated oven on the pizza stone for 3 to 4 minutes. Quickly and carefully spoon some of the ricotta fontina mixture over the top of the pizza pie and bake an additional 5 minutes to your desired doneness level. Once the pizza comes out of the oven you want to top it with the sautéed spinach and some of the roasted garlic cloves. Shave some parmigiana reggianno over the top and serve with freshly cracked black pepper. Friday night is pizza night at our house, and this pizza will be on the menu this Friday for sure. Florentina, this looks absolutely scrumptious! yay! send me pictures, I wanna see the party !! This looks seriously delicious! I can’t wait to try it! Thanks for sharing. I consider Pizza to be among one of my most beloveds, not far from my six boys in fact. Well, that may be a stretch but I think you know what I’m saying. Thank you for this beautiful specimen. Thank you for instructing your readers to use a hot stone. Thank you for putting the spinach on as it comes out of the oven. My only regret over this prize is that I’m not there to enjoy it with you. Very nicely done! Wow you are a true pizza enthuziast as they call them. I like you a lot, and you totally understand what I’m talking about with the pizza stone. there is no other way ! Auguri ! OMG you used 20 garlic gloves, I am already in love with this recipe only by reading that! So much garlic flavor and ricotta is amazing, honestly I can care less about the spinach at this time lol, just give me the cheese the dough and the garlic and I am happy! I love me a good pizza and this founds fantastic. Can’t wait to try it. I love pizza and yours looks really yummy! 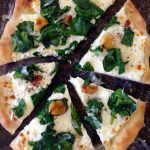 I love Spinach Ricotta pizza! 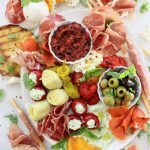 Makes such a nice change from tomato based pizzas, this looks fab! I agree, especially if you get that pizza crust nice and crisp , yummy ! 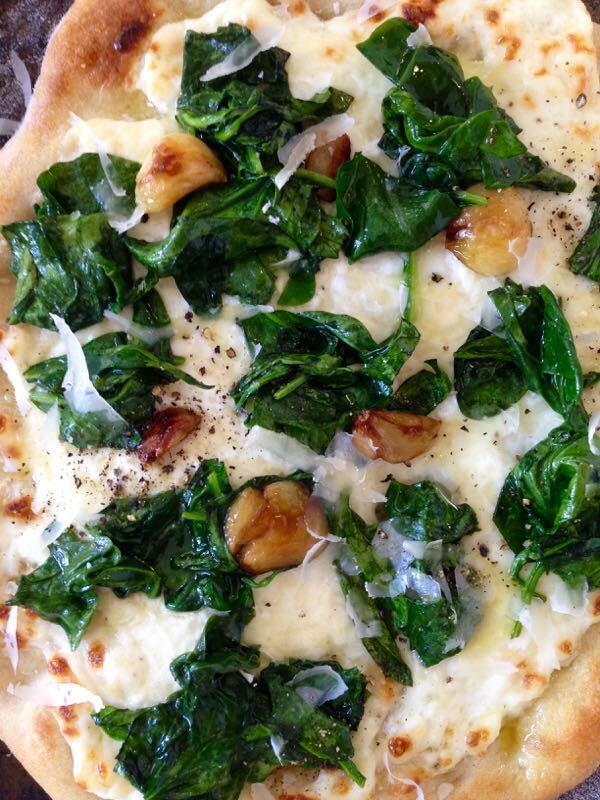 Those sweet roasted garlic cloves look delicious on this pizza! I need a slice of this in my life! Oooooh I put roasted garlic on my pizza last month and it is soooo perfect. I haven’t taken the plunge of pizza dough at home yet…maybe I’ll try soon! 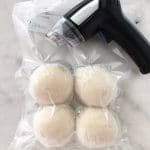 Hillary, it is so easy, and once you make your own pizza dough, You’ll never again buy it at the store. I love how organic and rustic it looks. I love pizza that has organic flavours on them! Ricotta and spinach and then the garlic, what wonderful flavor. Florentina, your pizzas are the most delicious/authentic looking pizzas I’ve ever seen. Loved the pizza series! 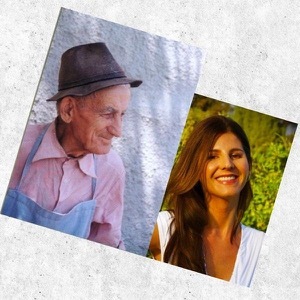 Florentina I definitely trust your Italian cooking. You’re my go to source for pizza now 🙂 Thanks for the recipe! Woohoo ! that’s fantastic makes me do the happy dance ! pizza for everyone ! Looove pizza with a white sauce and am obsessed with garlic so any recipe with 20+ garlic cloves always catches my eye! I’m Italian — I’ll take pizza any way I can get it. I love your combination. We use 00 flour and it makes the most pliable dough — fantastic. I’ll have to try your toppings. This looks fantastic, and I love both the look and the thickness of the crust. Thanks for sharing! Thanks Callie, hope you give it a go, happy weekend ! Your photography is awesome, considering all the photos are from an Iphone. I’m in awe! Once again, an amazing looking pizza recipe! The medley of the fontina, ricotta, and spinach sound delicious, and I love the big bits of garlic on top, as garlic is the tastiest around this time of year. This is the perfect way to say goodbye to summer! I love all the ingredients that you combined and can only imagine how perfectly delicious this pizza tastes. I am drooling at my computer screen! I’m such a fan of white pizza – more garlic and creaminess the better. This looks divine! I just came back to take one more look at this! Gosh, my stomach is begging me for a slice! Looks delicious. That’s one of my fav topping – spinach & ricotta, Yum. I’m not sure which pizza I like best, this one or the burrata. They both look fab! I guess I’ll have to try both. Any recipe that calls for 20 cloves of garlic is a FAVORITE of mine!! Amazing!! Oh Florentina! 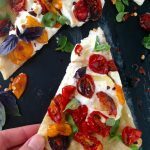 Another wonderful pizza recipe on my list to try for our pizza night 🙂 Looks fantastic! yes you must Oana, my plan is to test a new one every weekend , yum !